Reliable relocation services, legal assistance and aftercare: giving you headache-free life in Holland! Taking care of your arrival. With a dedicated housing search for short/long stay, viewing with/for you and taking care of the offers you make. Settling services dedicated to you. Registration at the municipality, Accounts, and insurance advice. We check all documents and protect against scams. Protecting you from common scams on the rental market, such as: double deposits, key exchange money and undefined reduction of deposit on moving out. With an impressive network of preferred partners and private investors, you get to choose from everything the market has to offer! Helping you during your move, but also after. With aftercare services like a translation of letters, application for subsidies and first line of contact with tenancy issues. Why don’t you have a look at our blog, we promise you will get to know us a lot better. More info? Download our brochure! At Dutchify, we want to help everyone with quality relocation services and that’s why we have packages for everyone. If you have limited time and you are looking for someone who takes care of everything for you, you need a pro package. With Dutchify Pro, we guarantee we will find you that home! You can also choose any custom selection of the services Dutchify provides and you can find details on our services in our brochure on the top of our homepage. At Dutchify, you can choose any combination of services that fit your needs perfectly. We commonly make a custom quotation that reflects the work that needs to be completed and the services you get in return. To make things easier we have drafted four packages you can instantly start with. We believe in transparency throughout our service, and this also includes a list of questions we hear a lot. We hand-picked the most important questions we get asked on a regular basis and we hope this convinces you, even more, to pick up the phone and start calling us. If your question is not on this list you can give us a call by going to our contact page, or schedule a meeting straight away! Yes we can. We can help you find housing, get a job and provide advice on all the insurances and services you need to start your life in the Netherlands. We do this by planning a dedicated search in our network of partners, and we link a personal agent to your case. With Dutchify you will have the best chance to start your life in the Netherlands and we can work with a deadline of just 14 days. I need a webcam for my interview? Why? This would be greatly appreciated, however, it’s not a requirement. We use a video interview to introduce you to your personal agent. In this way, you build up a relationship with him/her which is important when we are taking the next steps for you. You can also call our office and ask for your agent by his/her first name, how great is that! We first schedule a free interview, through phone or video chat, to introduce our company and get to know you. During this interview we discuss your needs and expectations, your desired move in date and the budget you are looking to rent for. Our agent also discusses the other aspects of your pending move, such as immigration, job and life services. This agent will determine if your search is realistic and advise a package based on this information. Once you have selected the package that best fits your needs, we are ready to go. Our service are there to protect you from common issues when renting an apartment. A quick visit to one of the many Facebook groups shows daily messages of people getting used/scammed in renting an apartment, and we are talking serious money here! Dutchify offers a wide variaty of services in job, home, life and aftercare and we have pre selected packages that are commonly picked by our clients. However, our agents can also select a custom package based on your needs. Did you know that Dutchify is 20 – 50 % cheaper than our competitors? The reason? We have a strong network of partners to which we outsource select activities, allowing Dutchify to focus on the most important aspect of relocation, and giving you the best service and price in return. We offer many convenient ways of payment, by offering payment options for all major credit cards and debit cards through our online store environment. We work with a 50 % upfront payment, and give a discount for full upfront payment and we can even make a custom payment arrangement for you. Next to this, our flexible cancelation policy ensures you money back if you dont like the results we present to you. Why should I choose Dutchify to help me? It’s becoming increasingly difficult to find apartments in the Netherlands. With an average price increase of 7 to 12 procent per year and a shortage of available houses in every major city in the Netherlands you will commonly get rejection after rejection when applying for an apartment. 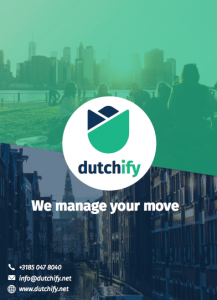 Dutchify has services that fully take over every step of your move, and we link a personal agent to every single case, allowing you to focus on your new job. We offer a transparent service process with attention to detail, we make the process personal, can complete a relocation in 14 days and we are commonly 20 – 50 % cheaper than all our competitors. ©2019 Dutchify · All rights reserved.